Thank you for visiting the website of TX Store Fixtures, located in Dallas on Irving Blvd by North Stemmons Freeway. We serve retailers across the nation by offering a wide variety of product displays at extremely competitive prices. Our display cases, slatwalls, clothing racks, mannequins, gondola shelving and other store fixtures in our inventory are a must for retailers that wish to appeal to their customers with beautiful product displays. Glance quickly at any retail magazine and you'll quickly realize how vital of a role store fixtures play in the selling process. Regardless of the quality of your product, merchandise that is not displayed well will always be more difficult to sell. On the other hand, the display cases at TX Store Fixtures will not only help increase product sales, but will also increase customer retention by making the overall shopping experience much more pleasant for your patrons. We have a large and versatile inventory of displays and slatwall that are perfect for your floor space, counter space, wall displays, and more. Whether you are in need of acrylic display stands, jewelry displays, display cases, glass showcases, pegboard accessories, corner cases, counters, register stands, countertop displays, wall cases, single bar racks, double bar racks, round racks, two way racks, four way racks, countertop racks, grid walls, grid bases, grid wall accessories, slatwall displays, slatwall accessories, bags, labelers, hook fasteners, clothes hangers, gondola shelving, plastic forms, dress forms, or full body mannequins, they are likely to find the ideal store fixtures at ultra-competitive prices. Once again we would like to thank you for visiting our site. 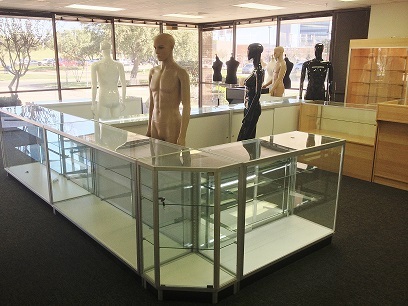 Please take some time to browse through our vast inventory of glass display cases, display cases, fixtures, slatwall, and accessories for stores, boutiques, kiosks, and other retail venues. If you have any questions regarding the products or pricing, simply click on the "Talk By Phone" button to access a representative who will be glad to address your needs. Have additional questions, contact us. Racks are a great way to display your merchandise and store your merchandise. Glass display cases allow you to display a wide range of items. They offer total visibility. Gondola shelves are available in a variety of shapes and sizes and with accessories for some flexibility. 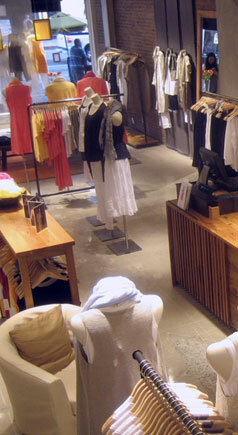 Dallas slatwall displays make it easy to display product and improve the shopping experience of your clientele.